Merge sort it is very effective sorting algorithm with an Worst Time complexity of O(n log(n)) being more effective in comparison with Quick sort O(n^2) and insertion sort O(n^2) for a hypothetical large data set. Check out big O notation cheat sheet at www.bigocheatsheet.com . This version example of Merge sort commes with comments explaining every step. Some of the syntax it is ES6. What does merge sort do ? 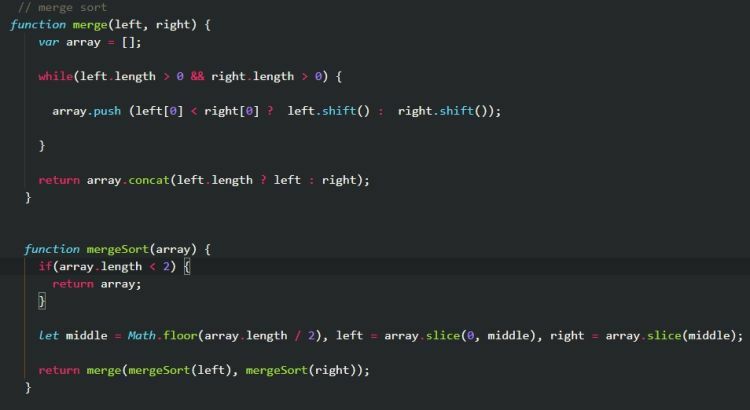 Merge sort splits recursively the given array into halfs until every element end up on it`s own. It is split to [5,7,6,2] and [8,9,7,3] on the first call of mergeSort, then is calling for merge helper function. Recursively mergeSort is going to split the halfs respectively [5,7,6,2] and [8,9,7,3] to [5,6] and [6,2] for the first parameter and [8,9,7,3] and so on.